Westgate LED canopy lighting / garage light fixture 40 watt 4000K for many types of security and general LED lighting needs. Ideal for indoor parking garages, commercial buildings, schools, gas stations, retail centers, apartment complexes. These are designed for 9 to 16-foot mounting heights, so something low to mid-range. The polycarbonate lens protects the high efficiency LED array and it helps distribute the light evenly in every direction while providing a certain amount of visual comfort, reducing glare. It is a low maintenance type of light where sometimes all you may have to do is to clean the outside surface. There are no bulbs to change and so you're going to get many years of reliable service and something that's going to provide excellent security for any area you use it in. This is the lowest wattage version of this low-profile LED canopy lights, but that doesn't mean it doesn't put out a lot of light. It's very effective for many areas where you need general security and you might have a lower ceiling to mount it on. It has a 70,000 hour rated life meaning it's going to give you many years of reliable service and light, but just in case it also has a five-year warranty against any early failure or defect. 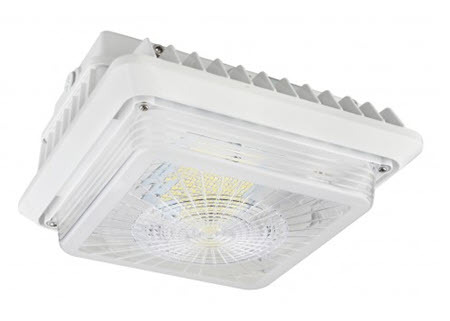 This will replace up to a 150 watt metal halide or high-pressure sodium light fixture and it will be much more trim and inobtrusive. It is wet location rated so you can have this exposed to the elements and not have any water getting inside. - 120 to 277 volt. - 70,000+ hour rated life. - Replaces 100-150 watt metal halide. - Low profile white housing. - Energy efficient for applications that are used frequently for long period of times. - Typical Mounting Height: 9 to 16 feet. - Typical Spacing: 1 to 1.5 times the mounting height. - Minimum starting temperature: -4. - WG 7-year limited warranty. - Die cast aluminum housing with decorative fins for heat dissipation. - Durable polyester powder coat finish. - 1/2" threaded conduit entries on two sides. One of the main concerns in investing in a new lighting system is energy savings and how much you can save in real dollars having a good payback for your investment. There’s never been a better time to consider going to something that’s more energy-efficient in LED canopy lightings because there are so many choices that will accomplish that energy reduction while getting something that looks a little bit better. If you’re unsure as to how much money you can save, we have a simple lighting payback spreadsheet that you can download from the left-hand column of our website. It gives you everything you need to compare an existing lighting system to one of our more efficient LED’s. All you have to do is input your current data for the outdoor lightss you may have now, comparing them to the new system with less wattage draw. Not only do we have a figure in there for energy savings but it will also calculate the payback, the time it takes to recoup your investment through energy savings. There’s also a figure that you can use for maintenance savings; all this put together can get you a swift payback. And if your electric utility has incentive programs for people upgrading their lighting with something more energy-efficient, you can see that go down even further. The return on investment on energy-efficient lighting is excellent these days, and it’s something to consider to reduce the cost of running your business or office. Now that we talked about energy efficiency, it’s time to talk about proper lighting. We often say that if you save all the energy in the world, but the lighting job turns out to be poorly done, you haven’t saved anything. Whatever you saved in energy you may lose in outdoor security or retail appearance like a gas station where some of these are often used. So it’s important to get this done right the first time. We want you to have good lighting while you’re saving a lot of energy. That’s the primary goal, and that’s what it’s all about. If you’re unsure about how many light fixtures you’ll need to get a good lighting job done, you can give us some of the information about the area you’re trying to light, and we can do a sample layout that will provide you with the required lighting for your situation. It’s an excellent way to make sure that what you’re doing is going to fit the task that you’re doing underneath the light as well as the general effect that it will have on the area. But will need some of those details from you which have to do with the dimensions of the space, how high the mounting is, and what you’ll be doing. All these things make a difference as to getting the right kind of light. If you’re going for a lighting upgrade that has utility incentives, you have one shot to get it right. But fear not, it can be done getting you the best possible lighting effect for any application. Another consideration that people need to take into account when changing over to new canopy lighting is color temperature. Sometimes people think it’s not that important then they will say that you can give me whatever you feel is best, but we don’t like to do that. It’s an individual choice whether you want something that’s going to have a warmer color appearance or something that’s going to be a cooler color. Typically the warmer color is something around 3000K; cool white is about 4100K and daylight is 5000K. A lot of businesses though prefer the 5000K daylight white lighting color because it’s so good with black and white contrast, reading and visual acuity. These are all things that will help people be more productive, and that will assist in making that happen. Call us or email if you have any questions about these LED canopy lightings or anything else you see on our website. We want to help you get the best lighting possible, and we have many years of reliable expertise in working with commercial and industrial customers, retail, home users, electricians, and general contractors.